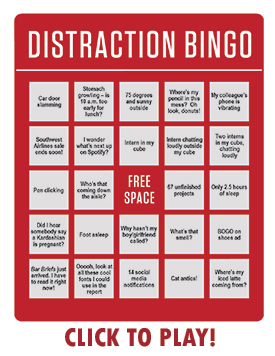 <p style="margin-top: 0; margin-bottom: 7px;">Here are some more ways stay on task and stop playing Distraction Bingo. 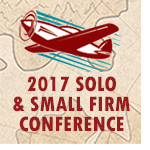 <p style="margin-top: 0; margin-bottom: 7px;">Whether you’re in a small firm or big law, marketing and business development skills are essential to your long-term success. These actions should start on your first day (OK- maybe not your very first day, we realize you need to learn where the coffee is), but remember, marketing and business development are as much about building strong relationships as they are about being recognized, so starting immediately is just smart. <p style="margin-top: 0; margin-bottom: 7px;">Interested in starting a diversity initiative, but don’t know where to start? Need help improving an existing diversity program? </p><p style="margin-top: 0; margin-bottom: 7px;">The 2017 Diversity Counsel Program gives you guidance for making your practice, your firm, and even your community a more welcoming, all-encompassing place. Hear practical, straightforward advice from judges and lawyers as they share their strategies for becoming more diverse and inclusive. <li>A legal action brought by one party without the participation or presence of the opposing party. <li>The relationship of a spouse to the other spouse's blood relatives. <li>A threatening clause that may be used in a last will and testament designed to prevent a challenge to the will by a beneficiary. <p style="margin-top: 0; margin-bottom: 7px;">Join the Public Interest Law Section at their annual Pitchers & Public Interest networking events. Come for drinks, appetizers, and a chance to connect with public interest attorneys. Registration is not required. <p style="margin-top: 0; margin-bottom: 10px;"><a href="http://marketplace.wisbar.org/Pages/Birthday.aspx">Get started here.